Stata is the most flexible and extensible data analysis package available from a commercial vendor. R is a similarly flexible free and open source package for data analysis, with over 3,000 add-on packages available. 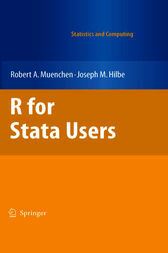 This book shows you how to extend the power of Stata through the use of R. It introduces R using Stata terminology with which you are already familiar. It steps through more than 30 programs written in both languages, comparing and contrasting the two packages' different approaches. When finished, you will be able to use R in conjunction with Stata, or separately, to import data, manage and transform it, create publication quality graphics, and perform basic statistical analyses. A glossary defines over 50 R terms using Stata jargon and again using more formal R terminology. The table of contents and index allow you to find equivalent R functions by looking up Stata commands and vice versa. The example programs and practice datasets for both R and Stata are available for download.